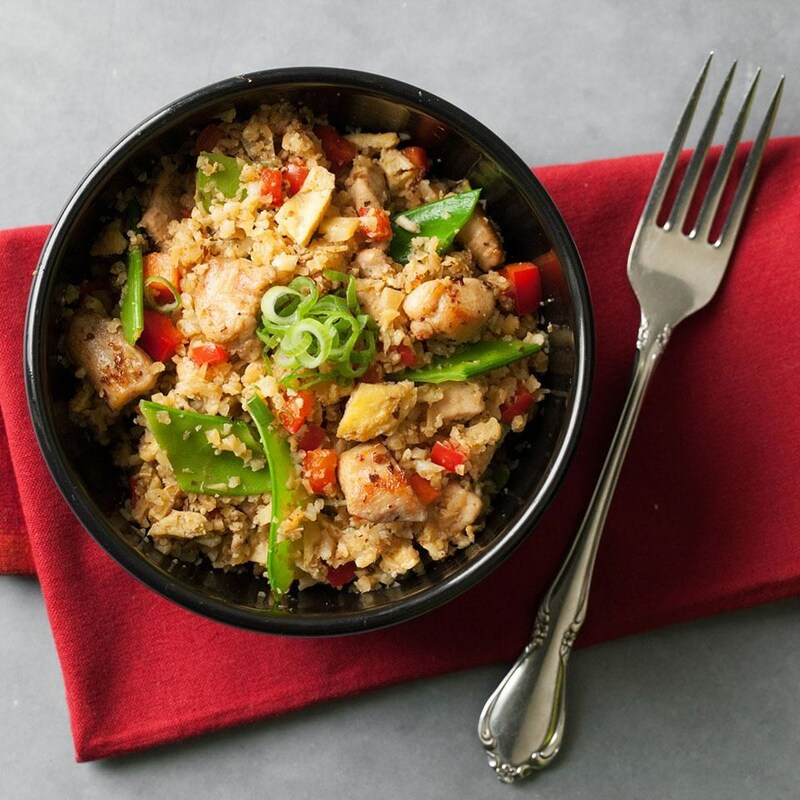 Get 3 easy ways to make cauliflower rice at home, plus nutrition information, how to cook it, recipe ideas and more. Cauliflower rice could not be easier to make and is a healthy veggie-packed carb swap for rice in fried rice, risotto, Mexican rice. sushi and more. There are a lot of reasons to love cauliflower rice. It's low-carb, gluten-free, keto-friendly, easy to make and is the perfect neutral base for a ton of different flavor combinations. And I love that I can swap it into any recipe where rice is called for to get more fiber and veggies in my diet. Let's start with calories: 1/2 cup of riced cauliflower delivers 37 calories, while 1/2 cup of cooked white rice has 100 calories. You'll also go from 22 grams of carbohydrates per cup to just 7 grams per cup when you switch from white rice to cauliflower. That's a savings of 63 calories and 15 grams of carbs. Added bonus: You'll get 3 grams more fiber when you choose cauliflower rice. Option 1: Use a food processor. Just add the cauliflower florets and let the food processor do the work for you. Pulse the cauliflower until it's chopped into rice-sized pieces. Option 2: Use a grater. Just like grating cheese, slide the florets up and down the grater. This leaves you with perfect rice-sized pieces but will take a little bit longer than busting out your food processor. Option 3: Buy it. You can find riced cauliflower at almost any grocery store. Trader Joe's sells it frozen and fresh. Most grocery stores will have some in the frozen vegetables section and in the prepared produce section. 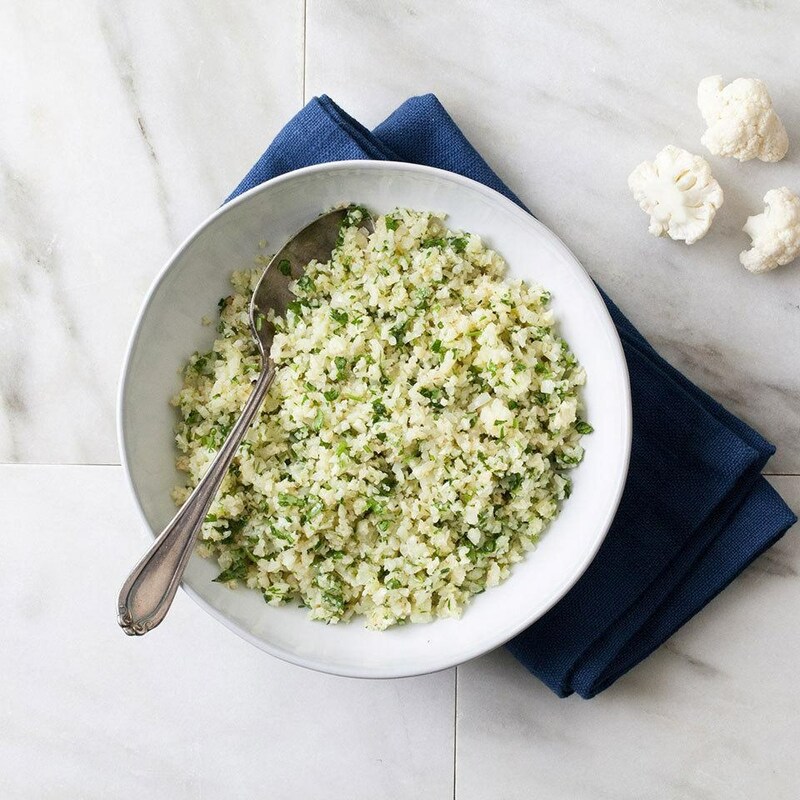 Green Giant sells frozen cauliflower plain, as a medley with other veggies and as a risotto (plus, they have a whole line of other riced veggies in the freezer). Frozen cauli rice is a great staple to keep in your freezer for quick weeknight dinners. Once you've gotten your vegetable into rice-sized pieces, you'll want to heat it up a bit. Packages of pre-made cauliflower rice come with instructions, so go ahead and follow the back of the bag. If you make your own cauliflower rice, cook it on the stove. Heat a little oil in a skillet on medium-high heat, add your cauliflower rice and cook, stirring occasionally, for about 5 minutes, until softened. 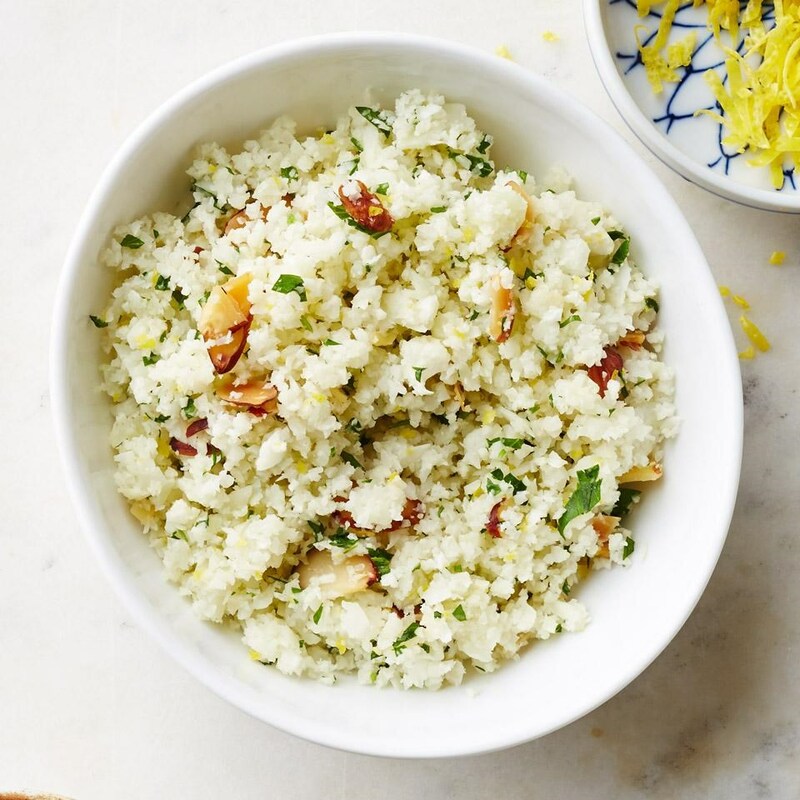 Now that you know how to make cauliflower rice, here are some fun recipes to make. A super-simple recipe that still has plenty of flavor thanks to the use of fresh herbs—try chives, parsley, basil and cilantro. This zesty and herbaceous dish gets topped with chopped almonds for flavorful rice pilaf with a crunch. Our take on classic fried rice makes for a well-rounded meal that's packed with flavor.